Try this dish with Better Than Bouillon® Reduced Sodium or Organic Roasted Chicken Base. Add the Wing Sauce and Roasted Chicken broth to the bowl of a slow cooker, stir. Add the chicken breasts, cover with the lid and cook on high for 4 hours. Remove the lid from the slow cooker and using two forks shred the chicken and toss in the remaining sauce. 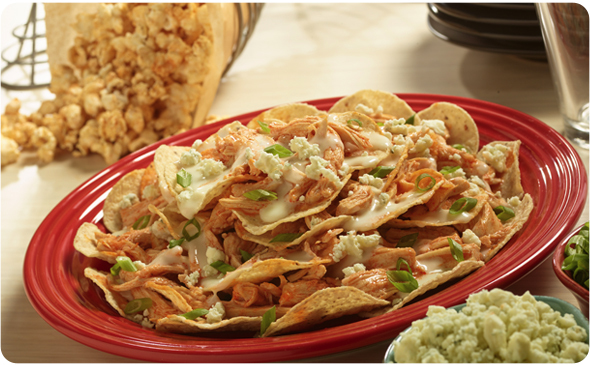 Divide the chips between plates, top with shredded chicken, melted cheese, sprinkle with bleu cheese, and green onions.